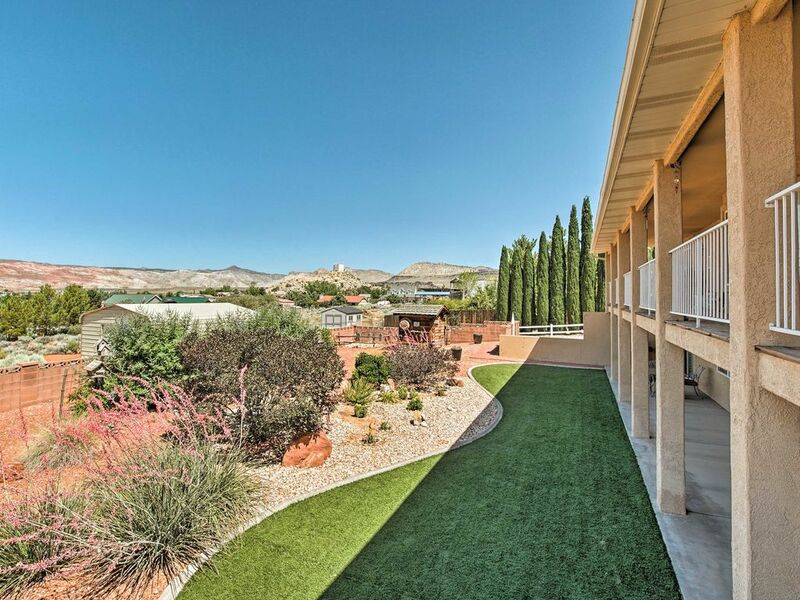 Your Utah getaway begins at this 2-bedroom, 1-bathroom vacation rental apartment in St. George. Featuring all the comforts and amenities of home, the apartment comfortably accommodates up to 6 guests. You'll be 5 minutes to the entrance of Snow Canyon State Park, 20 minutes from Tuacahn Amphitheater, 1 hour from Zion, and close to Sand Hollow Lake State Park! Arrive at the ground floor apartment and admire the stunning views from the property, including a view of Snow Canyon State Park. The exterior is well-kept and picturesque, offering a lovely setting for your vacation. Inside, the property is well-appointed and decorated with comfort in mind. You’ll look forward to returning after a nearby hike to stretch out and relax on the large living room sectional as a movie plays on the flat-screen cable TV. When dinnertime approaches, make your way to the fully equipped kitchen to prepare a delicious home-cooked meal for your group. There’s ample space for helping hands when setting the dining table and cleaning up after dinner! Switch up the cooking routing and let dinner sizzle on the patio grill. A peaceful slumber awaits in one of the 2 comfortable bedrooms, featuring ample storage space and cozy sleeping arrangements. A pullout Murphy bed is tucked away in the formal living area, still offering plenty of privacy. The Winchester Hills community of St. George is an excellent home base for outdoor enthusiasts, nature lovers, and travelers seeking a bit of R&R. Nearby, you’ll find numerous hikes and opportunities to explore! For a picturesque hike or mountain bike ride, check out trails such as Barrel Roll, Bearclaw Poppy, Johnson Canyon, Whiptail Trail, Cinder Cone Trail, and so many more! Elevate your experience and visit the breathtaking parks that surround St. George, including Zion National Park. Additionally, your trip wouldn’t be complete without a scenic tour, ATV or horseback ride, or a day on the water at Sand Hollow State park, Quail Creek, or Gunlock. Golfers will love the Red Rock Golf Trail, offering stunning vistas and challenging shots, or The Ledge Golf Club just 5 minutes away. Dixie State University nearby offers many activities including concerts, musicals and plays! After a show, head into town for a delicious meal at one of the numerous local restaurants. Great home! Super clean! The owners have thought of everything! You will feel right at home here. They went above and beyond to make sure we were comfortable after an unusual snow storm. Sidewalks were shoveled by 7:00 am, our car was swept twice before we ventured out, and then they checked on us to see if we got to town ok. Oh and they even offered to bring us food in case we couldn't get out! Top notch owners! By the way, the Fish Rock Grill (5 minute drive) was great! We loved our stay here, the location was wonderful. The place was so neat, organized, and had everything that we needed and more along with the beautiful decorations. The owners were kind and welcoming since the first time we came in contact with them, we greatly recommend this place and will certainly be comming back! Lovely home near Snow Canyon. The accommodations were comfortable and had everything that we needed. We enjoyed seeing the red cliffs from all of the many windows. There is a large, covered patio with furniture to hang out on and a sizeable, fenced yard.The hosts were very responsive to our slightest request and were even kind enough to ship my teenager's laptop to her when she left it behind. We will definitely stay here again! Spacious and welcoming. Excellent visit! Excellent experience in all categories. This was truly home away for us while we visited St. George for a high school sports competition. The place was perfectly clean and generously furnished. We found cute bed rooms and spacious living areas, with plenty of places to relax or play games. This felt like home and far exceeded the comforts of a hotel. This property was relaxing and inviting for our group of 5. The kitchen was large and fully furnished. The owners were kind and welcoming; we were even surprised by a yummy treat upon our arrival. We found numerous games, toys, tvs, movies and extra bedding. Kids watched spongebob until 2 am, and I didn't hear a thing. Cable TV and internet was a nice addition for the teens. We didn't need the high chair, or toddler toys, but the owners really did think of everything! We plan to stay here anytime we visit beautiful St. George. There was plenty of parking available. The neighborhood was quiet and safe. We woke to the beautiful view of the red rocks and spent some time on the spacious patio in the early morning cool. We will strongly recommend this property to anyone. Thank you for welcoming us and making this a memorable experience for our family.